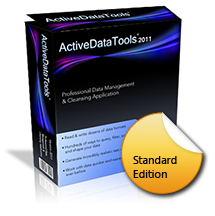 There are two editions of ActiveDataTools 2014, Standard and Professional. To find out which features are available in each edition, see our Feature Comparison page. Upgrading from Standard to Professional? If you've previously purchased the Standard Edition and you wish to upgrade your license to the Professional, you can purchase an upgrade license here. All prices are subject to relevant sales taxes. Our payment system is operated by RegNow.com, part of the Digital River Group.